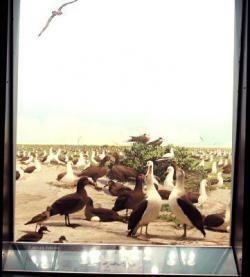 The doctor loved to look at albatrosses, and in Desolation Island had a chance to watch their nesting closely. These are Layson albatrosses (Diomedia immutabilis), different in markings and size from the Royal Albatross (Diomedea epomophora, aver. wgt. 17 lbs., wing span of 11.5 ft.) which he saw more frequently in the southern seas. They are both tube-noses, sharing the same body plan, and life style. The feature of the tube nose, or nostrils at the end of tubes on either side of the beak, is not completely explained. As albatrosses are totally birds of the open oceans, they drink nothing but seawater and their nasal glands secrete the excess salt. Perhaps the tube prevents this salt water from affecting the eyes. Albatrosses also secrete unpleasant smelling oil in their stomach which is used to spray at an aggressor. This is especially true of hatchlings while sitting in their nest, unable to fly. Albatrosses feed primarily on squid, but occasionally on fish, other birds, carrion, or seeds.